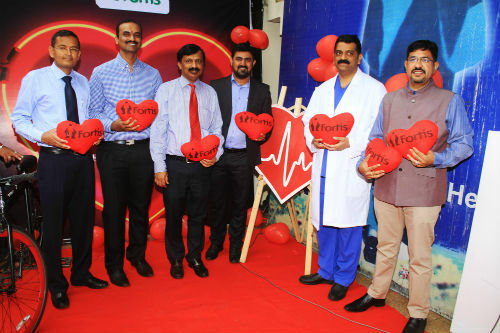 Bangalore: On the occasion of World Heart Day, Fortis Hospital, Bangalore has organized a two day event, ‘Charge your heart’ at Cunningham road followed by Garuda Mall to spread awareness regarding being heart healthy. The event is to be held today and tomorrow respectively. The hospital has set up a huge LED heart connected to a cycle. Continuous pedaling keeps the light on in the mounted heart. The initiative is aimed at educating people on importance of keeping the heart healthy and various ways to do the same. World Heart Day is celebrated every year on 29th September with the intent of raising awareness about cardiovascular disease. The theme of this year’s World Heart Day is share the power which aims on how you power your heart and inspire millions of people around the world to be heart healthy. Following the theme, the event has been encouraging people to get involved in physical activities for keeping their heart healthy. Dr Vivek Jawali, Chairman, Department of Cardio Vascular Sciences, Chairman of the Medical Advisory Council, Fortis Hospitals, Bangalore will be driving the initiative to be able to share the knowledge on heart related ailments due to poor lifestyle. WHO states that approximately 4280 people in every one lakh die each year from sudden cardiac arrests in India alone. According a report by NCBI, Cardiovascular diseases are on a rise among younger people with over 50% of Cardiovascular Disease (CVD) mortality occurring in individuals aged less than 50 years. Population living in cities are three times more prone to heart attacks than people living in villages. Increasing rates of CAD in India in last three decades sends an alarm to look for the factors responsible for its increasing prevalence. Unhealthy diet is the major reason behind the heart related disorders especially among the youth. Due to change in lifestyle, modernization and too much exposure to junk food is leading to diabetes and hypertension at an early age, which is directly linked to heart problems. I believe the initiatives like this will promote awareness regarding healthy activities among the people”. To lead a healthy lifestyle and prevent heart ailment it is extremely important to be physically active, stay away from smoking and keep a check on blood sugar and cholesterol levels.